Yumiko and Tom Virant bought their first home in 2003, knowing it was a fixer-upper. The floor plan was awkward and the interior was a mishmash of remodels, but they didn’t realize their plans for a small-scale remodel would evolve into a two-year, top-to-bottom renovation. When the couple first saw the 1961 modernist-style house perched on the side of a mountain deep in the woods near Asheville, its good bones, affordability, lush surroundings, and location, excited them. But it wasn’t until Yumiko and Tom, an architect and contractor respectively who met as undergraduates, cut a couple holes in the ceiling that they discovered the roof was in terrible shape. “At that point, we realized we either needed to get out or go all the way,” Tom says. Their love for the house won out, and they went all in. The boxy, flat-roofed contemporary shape of the home stands out from the mix of craftsman and luxury-style homes that dot Sunset Mountain, but it fits the couple’s design aesthetics. Tom likes to use natural building materials, while Yumiko’s architectural sense is rooted in her memories of childhood summers spent with her grandparents in Japan. Elements such as honey-hued wooden support beams and floor-to-ceiling windows that connect each room to the outside reflect their tastes. The couple handled all the design and much of the labor on their 2,300-square-foot renovation themselves. Yumiko and Tom typically work together on residential design and build projects through their businesses, Virant Architecture and Virant Design. From the roof, to the electrical and mechanical systems, to interior walls, to the landscape, almost everything about the home was replaced or reimagined. Today, the interior continues to pay homage to the modern style; the austerity of its strong lines are softened with detail-conscious use of materials. Fixtures like a side-angle German-imported sink in the hallway bathroom or the countertop edge that flaunts its lamination (rather than concealing it), reveal the couple’s appreciation for playful design. 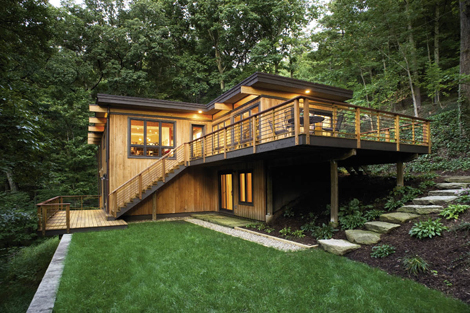 Outside, the bold decks with their industrial-style railings protrude over the dense green forest below. “We’re really aware of the seasons in this house. We’re always watching the rain and snow and seeing new leaves open on the trees,” Yumiko says. The home has grown with them—from an ideal place for a couple, to a family home complete with a living room play area ideal for their two-and-a-half-year-old son. Though the renovation project may have been more extensive than they originally planned, they now have a home that only they could have dreamt up. “This house is part of our souls now,” says Yumiko.